I woke up that morning overwhelmed, sad and cranky. Rick was the only one who knew what was going on. But even in the midst of the intense prayer times, the worship music and the fun I was having my focus was on how much I miss my girl. I needed some time alone so after a quick breakfast I volunteered to go to the morning update for the leaders. I was able to sneak away and sit in the back of the room and just pray and talk to God. Pastor Ryan came in just before the update started. At the end of the information before we got up to leave, I shared how I was feeling with Ryan. I was in tears at that point, just feeling overwhelmed by the hurt. Ryan prayed for me and gave me a big hug. It felt good to be able to share the burden. I was able to get my head together and I headed into prayer time before the morning rally. Every song was touching my heart. Every hug that day just meant so much more. I was very vulnerable. We went to lunch then we headed to a local park for some free time. The intense prayer, classes and sharing experiences needed to be processed so we got away for a while. Some of the boys were playing ultimate frisbee, some of the girls went shopping, two of the leaders were having a quiet discussion and a small group of us were listening and singing along with some quiet guitar music. No expectations, just sitting back relaxing. I noticed a leader from another group walking with a homeless man. Something drew my eyes to them and I commented to Hayley about the pair. 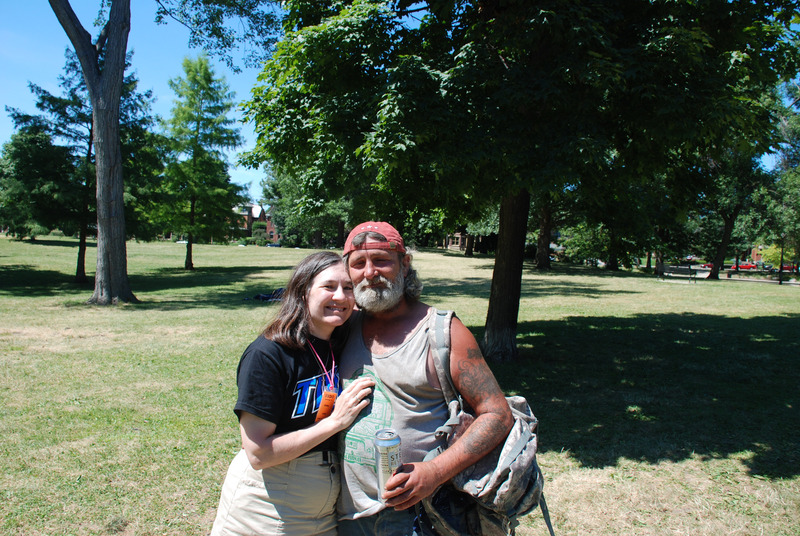 She shared with me that the homeless man had lost his son and that he had been shot and killed. I asked her how she knew that and she said that Anna had told her. At that moment Anna came up and confirmed the story. She said that he was very angry with God because of his son’s death. Before I knew it I was on my feet and walking quickly to find him. Anna was walking with me and I told her that I felt compelled to find him. We walked about 50 feet around a corner on the path when we spotted them. I asked Anna to keep praying and I approached the two men. I walked directly up to the men, introduced myself, put my hand on the chest of the homeless man and said, “I need to talk to you. I understand that your son was shot and killed. My daughter was shot and killed also. I wanted to let you know that I understand your pain.” Well he was reeling from my comment and asked me my name again. Introductions were quickly made. The other man from Challenge was Jim. My new friend’s name was Gene. Gene is a man who is homeless and hungry, alone and tired. Hurting. Gene informed me that his son, Ian, was 24 when he was shot and killed on the streets of Columbus. He told me that he served two tours in Vietnam and that the only thing that took away his pain was when he was drunk. Gene is hungry for a beer to quench the hurt of the flesh and of the heart. Hungry for healing. Gene is proud of the fact that he is strong and that he has survived so far. We shared our hearts. We shared tears. We shared stories of the nightmares that woke us up in the middle of the night. He is full of hatred for the man who killed his son. Hatred for the God who took his son away. We prayed together for the hurt to go away. I was overwhelmed and scared at this encounter. Overwhelmed by the raw human emotions that were staring at me from his eyes. Scared that God wanted me to talk to him. Not sure what to do except share our story. I shared our forgiveness of our son-in-law and how we gave him a bible. Gene told me I was crazy and I started laughing. Soon we were all laughing as we started walking. Jim and I starting walking him to White Castle to get food. Along the way he broke down several times, crying about his son and his hurting soul. He asked us to buy him a beer and I kept saying no. He would ask Jim and I said no again. Gene commented that I was using tough love and him and asked me why I answered for Jim. I told him that I was stubborn and that love did hard things sometimes. During one of the moments when he was crying he asked me to pray for his son. Not knowing anything about his son I prayed for his soul and then I prayed for Gene’s heart to be healed by the only Healer that mattered. I prayed for God to rock Gene’s world and that Gene would accept God’s gift of salvation. Gene prayed the Lord’s Prayer out loud. I felt so inadequate but God was so evident. Out of the blue Pastor Ryan, Sean and Wade appeared on the same street we were on. I introduced them and Gene wanted to know who they were. I said they were friends who loved me and lifted me up in prayer. He said something to me about where we all came from. I told him Pittsburgh but he said no where did you come from today, how did you find me. I told him that it was a God appointment. We were all in the park at the same time and that God arranged for us to meet today, the third anniversary of my daughter’s death. Ryan confirmed that she died three years ago today and Gene looked frightened and yet impressed. He kept asking me over and over how I found him. I just said that God put us together. We got to White Castle and Jim ordered a bag of hamburgers. Gene refused to eat unless I ate with him. He said that no man would eat in front of a woman who wasn’t eating too! So I grabbed a burger, tore it in half and gave it to Ryan. We all broke bread together. Gene asked for a beer again but again we all said no. We talked, we cried , we prayed. I stuffed the left over hamburgers in his backpack and we left White Castle. We all started heading back to the park. Our last thing was me crying because he wouldn’t pray to accept Christ. Gene leaned over and said don’t cry girlie, I know God and I will think about what you said. I am not worth crying over. I gave him a huge hug and said that he was my friend and that I loved him and that he will always be worth crying over. We all left to head back to the convention center and he headed back to the park. I am still blown away. God used our daughter’s death to reach out to another hurting soul. I feel as if her death has been redeemed in my heart. I am at peace with the fact that she is in Heaven, no longer struggling but celebrating. God is healing my heart. Another piece of the puzzle of our journey has fallen into place. On the day that started out in sadness and mourning, turned into a day of sacrifice and sharing of God’s love and blessing. I am sad that Gene did not accept the gift of salvation but I am also hope-filled that the seeds that were planted fell on open fertile ground. I will continue to pray for this brother of the heart. If you live in the Columbus area stop by Goodall Park and say a prayer for a fallen soldier, a broken man, a hurting father, my friend, Gene! God Bless your journey! « A God Seeking Heart? What an incredible story! I am speechless! I miss you too. It was an amazing day. God is so amazing. What a moving example of God’s perfectly timed interactions. Thank you for sharing your heart. I was moved to tears. May I ask your permission to add a post to the EFCA Facebook page pointing others in the EFCA body to this story–to join you in prayer for Gene, and–if they’re in Columbus, stop by Goodall Park? Kathy, thank you for sharing this! I have had trouble stopping the crying. You see, I was once a volunteer youth leader who led kids to Challenge ’88 & ’89 (we had no youth pastor), since that time I have always worked in some capacity w/youth but have experienced betrayal/lies/abandonment from “christian” people that I have worked alongside & ministered to. On top of that, I too, had a son die of SIDS when he was 77 days old. The words of Gene, “I am not worth crying over” nailed me, because that is EXACTLY how I have felt for the past 19 years. Bless you for your response to him, because I have had a dear, dear person dare to care enough about me for the past 12 years to try to patiently, lovingly be Christ in the flesh to me. God NEVER gives up on even when we have given up on ourselves! He has used me on several occasions to minister to parents who have lost a child, or someone close. EVERY SINGLE PERSON IS ALWAYS WORTH CRYING FOR! Jesus wept for the people of Jerusalem right before He entered triumphantly on the colt to fulfill His destiny for US. God Bless all of you who were @ the UNDO challenge 2010! I was praying for you & for kids I knew were attending. May we all join together in heaven praising Him in one voice! I am so sorry for the loss of your baby boy. Words are never enough but please know that I understand the hurt and the pain you are still feeling. Meeting Gene was one of those God moments in my life that I will never forget. Looking into his eyes and seeing the pain and the hurt broke my heart. Knowing that God cared enough to put us both in that park at the same time has left me in awe at his love and care. God cares about all of us and I am blessed and honored that I was able to be in Goodall Park at that moment. Thank you so much for the prayers and encouragement. I love being with the students and watching them light up during those precious moments when they see God at work. I am confident there will be follow-up on Gene as I was unknowingly part of it already. My group was scheduled for ministry on Friday, July 2nd. We were giving away sunscreen in Goodale Park to the growing crowd waiting for the fireworks that night. We met Gene and four of his friends that day. He gave us a lot of his story as well & gave similar responses to our conversation with him about accepting Christ. Additionally, another man in his group said he had 3 months to live due to cancer, another was almost impossible to understand but was clearly dealing with a lot of pain & alcohol. The other two were more receptive. Tom (the youngest of the bunch) claimed to be a straying believer and was VERY inquisitive – thoughtfully so – about the Truth. The sole woman, Trish actually prayed with us to receive Christ. We can’t be sure of her sobriety at the time… but nonetheless there was openness & interest. The Challenge office gave us the name & location of a local church to point them towards for help in living for Him. I say all this to express that GOD IS following up on Gene. Whether there are a lot more park visitors, through the church there, or from his associates… we’ll see! Praise Him! We’ll continue to pray! wow! I met Gene the next day and he said a lot of the same. We had a really good conversation but he wasn’t ready to deal with God. My youth pastor and I were able to leave one of his friends information for a church nearby so maybe they will eventually go together. I just wanted to let you know that I am praying for him too. I love to watch how the pieces of the puzzle are put together. Different people from different parts of the country coming together in a park to spread God’s word. Lives intersected, lives changed. I am in awe over the plans.